Fully Dressed and Ready to Dance! 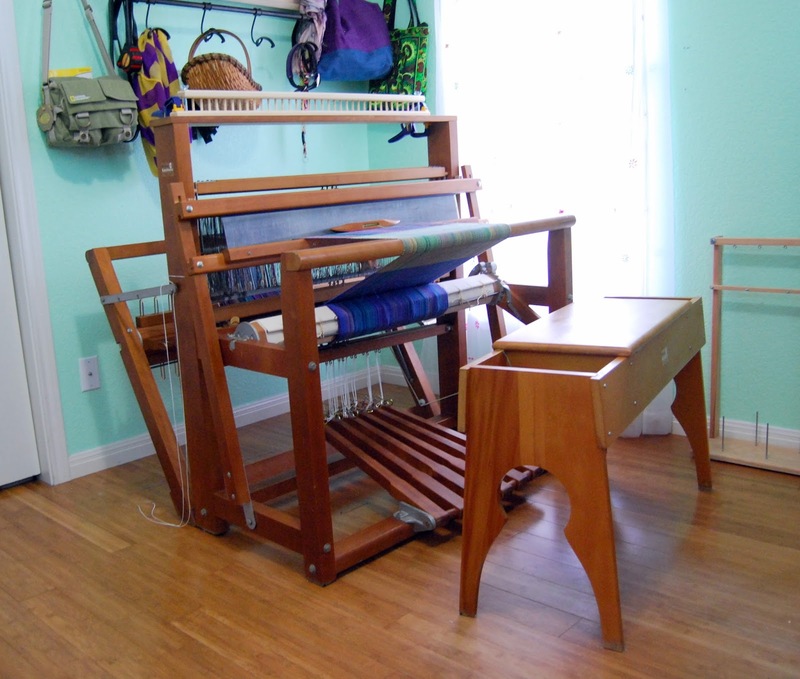 The little Leclerc Nilus loom is fully functional and weaving away! In addition to new treadle hooks and tie-ups, she has a new cloth beam pawl, a completely new brake system (brake circle, spring, lever, pulley for the brake release cord, brake cord, and brake locking catch), she has new sectional beam brackets, and a custom raddle from Handywoman on Etsy. There are several other little parts and pieces that we also replaced, but I think it is clear that she has had something of an overhaul. The old 12-dent reed has a good bit of rust on it, which is my project for the coming week, but I also bought a 10-dent reed, which she is sporting now. 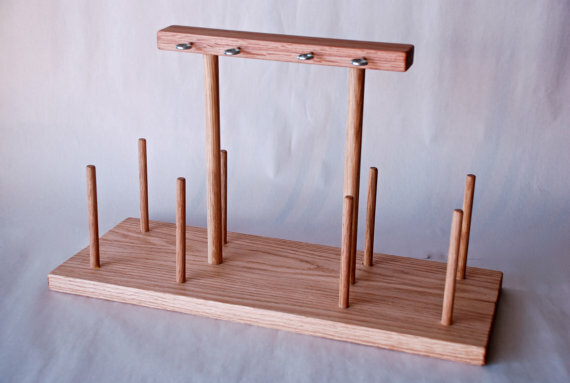 She has new insertion eye heddles and heddle support bars, which have only just arrived. 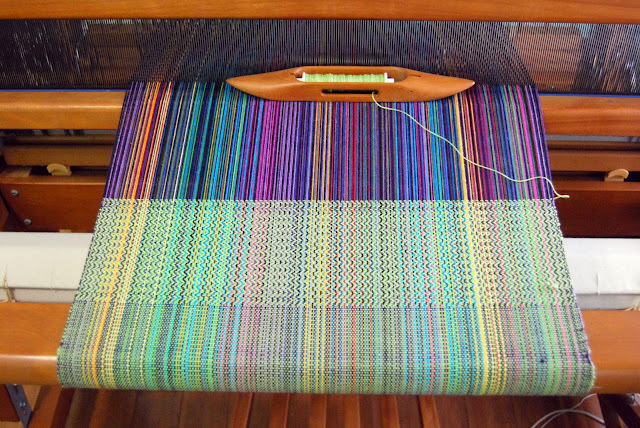 As soon as this warp is done, those will go on, too. She cleaned up very nicely, and I think she is enjoying the attention, as well as her corner full of light. Everything, except the heddles and raddle were purchased from Camilla Valley Farms. I could not recommend them more: excellent knowledge base, helpful, and superb customer service. The owner's name is Nina Manners, and I was delighted to send emails to "Miss Manners." Alas, I am easily amused. Prior to her arrival, I had a multicolored warp of 8/2 cotton ready to go. 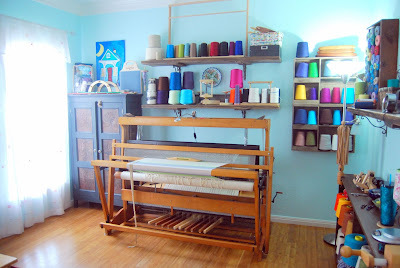 While I hate to refer to anything as waste, I was unsure what kinks we would need to work out with her, so I had no real plans for this warp, it was just something relatively inexpensive that might ultimately become dish towels or something. With that in mind, I also took the opportunity to use up several spools of 8/2 cotton and 8/4 cotton rug warp from earlier projects. The light green below is the third color. I started with a dark purple, which was gorgeous. This was followed by a bright blue (very pretty), and now the green. To liven the even weave up, I opted to play with a twill pattern, as well. The brake system was completed on Friday evening, but I did not have a chance to weave on her again until last night. She needed a tweak, as the brake kept slipping when I advanced the warp to tighten things up. The handsome husband had to help me (brute strength and all). Once it was adjusted, she was just right! Then I had the husband sit at the loom and I talked him through a repeat of the twill pattern. Yes, my husband tried his hand at weaving, bless him!! I do not think he will pick it up as a past time, but I think he may have liked it. At least, I believe he appreciated the process. He already considers himself quite the loom repairman, as he should. In other news, the very last piece of equipment to the studio has been acquired. Last year, I bought a cone holder that is about 12 inches tall. 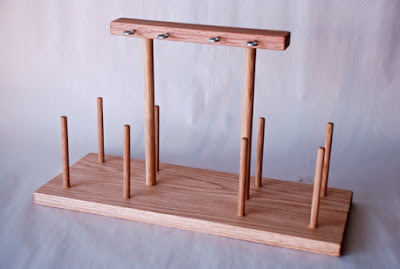 It is made of red oak and is very sturdy. 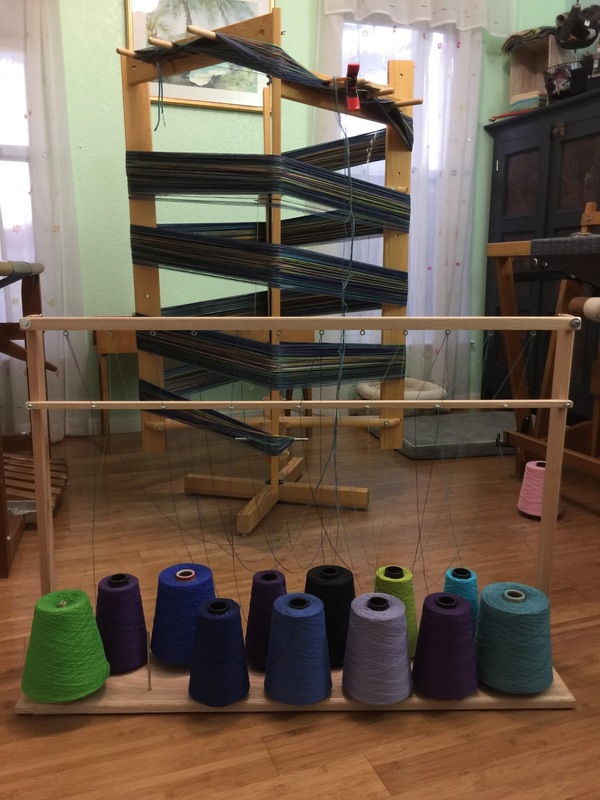 With the smaller half-pound tubes of 8/2 cottolin, it worked okay when preparing warp on a warping board; however, warping with the 1# cones of 8/2 cotton or tencel, it was NIGHTMARISH. There was not enough distance between the cone and the eyes for the thread to come off the large cones easily, and I had to constantly tug and pull (and swear), every half turn of the warping mill. It was incredibly frustrating, to say the very least. Maria of Passing Down Crazy (@quiltmomoffive on Instagram) is a lovely lady and friend who has provided a great deal of inspiration and encouragement to me over the years, as I have followed her lead with knitting lace and weaving. We finally got to meet at a knitting retreat a couple of years ago! In a fit of absolute frustration, I sent her an email, explaining what I was doing, how upset I was, and asked for help on what I was doing wrong. As always, she was kind and told me the only thing that would help would be a taller cone stand. She sent me links to this one and this one. Maria has never lead me astray, so I was ready to order one immediately; however, I then remembered Handywoman on Etsy was making a raddle for me. So, I zipped her off an email with a picture and asked her if she thought she could make a cone holder for me, too. She responded: "Absolutely!" We had a brief discussion of size and whether the rods needed to be removable for extra large cones (to which I replied, "Yes, please") and last week it arrived. To say the storm clouds over my warp winding problems parted and the glorious sun shone brightly thereafter is a gross understatement. Handywoman now has them available in her Etsy shop. She also blogged about it here. Lastly, through this warp winding process, I also realized that if I have a sett of 24 (2 threads per slot on a 12 dent reed), I can bundle 24 threads together. Every 24 threads is an inch in width for my project. Thus, I only need as many bundles as I need inches in weaving width. That makes keeping track of the number of ends so much easier. In the photo above, I threaded 12 ends. From the starting point to the end peg and back equal 24 threads. 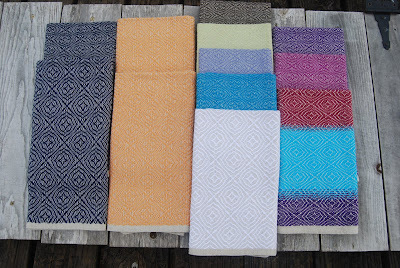 To achieve a project width of 30 inches, I needed to do that 30 times, bundling after every trip. The warp is 11/2 cottolin. There are 24 threads. I simply took a piece of nylon cord, folded in half with the ends pulled through the loop. Every 24 ends, I bundle again. Here is a shot of the 30 bundles we did over the weekend. A bonus in bundling this way: When it comes time to assign threads to the raddle, I simply remove the threads from a bunch as I drop them in the raddle without the need to count them again. The threads are also bundled in order, which helps prevent them from overlapping. Such a gorgeous warp! And it really did roll on the mill with so much more ease! AND FAST! I am also glad that you did all the work on this learning curve for us. Your detailed notes are so helpful. Thx!